It is so much fun herding DD kittens that Uli has expanded his clowder to include NZVIF and Zino. As a result, the formidable Chinese DD contingent is doing a fabulous job of getting to the ginseng roots of Magical Park/Mall. Clowder is standard parlance in cat herder circles for a group of cats, angelic or not. It is to cats what a flock is to sheep or a shock to hair. Heath is dealing with Aᴍʙɪᴛious DD for Aᴍʙɪᴛ, coordinating FKA, Sparkbox, K1W1, Lewis Holdings and NZVIF. Phil, Erick and Martin are the three FKAngels supporting Heath. We have three pitches pencilled for this month. Kademi ◇ Ralf Wittgen, Eight360 ◇ Ian Clarke, Moxion ◇ Rudi Bublitz. Now, you ☞ pencil Tue, 16 Oct, 18:30 in your diary for Pitch Night #45. Two interesting companies have been referred by Angel Investors Marlborough and Movac respectively and have come through ADI, Hectre and Mooven. Both have an intersection at traffic jams, the latter is managing traffic, the former is managing orchards that produce the necessary fruit for jam. Our DFM aka Deal Flow Master, Uli can ☞ put you in touch. For the linguists: A group of penguins in the water is called a 'raft', a group of penguins on land is called a 'waddle'. This is clearly more common language among Shark Tank affiliated investors! It's time for the AANZ annual investor survey. Over 75, including one CCH, have filled it out already. First insight: 1 in 4 angels had a business failure in the past. Maybe making them better investors? Last year's findings included that a third of angels were born overseas and the average number of ventures in an individual's portfolio went up from 8 in 2016 to 13 in 2017. But, maybe that was just because The King of Spray and Pray and Arch Angel of 2016, Trevor Dickinson missed the 2016 survey? Trevor and you, other angelic readers, don't miss ☞ completing the 2018 survey! It doesn't take long and has some interesting questions that Chief SurveyMonkey Debra has put together. Suse from AANZ is also calling for nominations for three awards that recognise those angels that have made a significant contribution to the Kiwi angel community or have set a fine example for new angels. Nominate from the circle you know and the judges will compare nominations across the whole country. Little did Ben know that he would embark on a journey to becoming the CDM aka Chief Dress Maker of the ZOZOSUIT in 2017. However, fashion is fickle! There will be a series of launch events in Auckland, Wellington and Christchurch in late November and early December to mark the official opening for the 2019 entries. That will be inspiring stuff for founders and angels alike, so ☞ book now to secure your place. Little known fact: FKA invested in SSL in 2014 and Ben highly recommended that Ian Clarke, then CEO of the category sponsor Fronde, to join FKA. Ian is now our Investor Rep for Techion, our convenor for ADI Wellington, and he is bringing Eight360 to our October pitch night. Thanks Ben, thanks Ian. ACA on ICO. With an estimated $14B+ raised this year alone, initial coin offerings (ICOs) are making a mark on venture finance. What is the impact of ICOs on companies with angel funding and the impact on angels? Join this expert panel in a webinar discussion on market trends, legal and accounting issues. 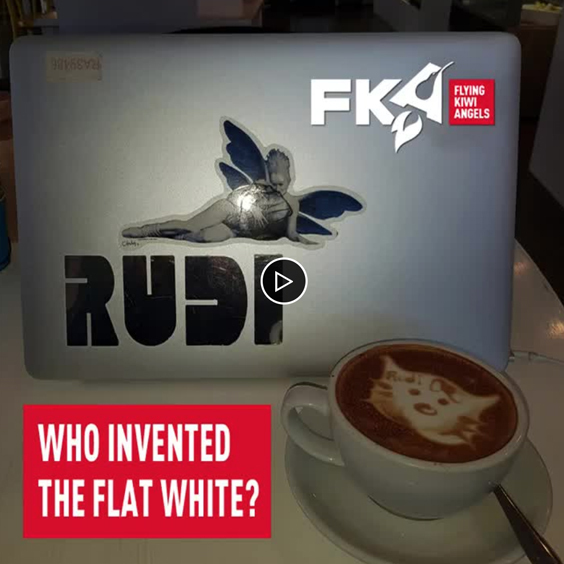 It is not about whether the Kiwis or the Aussies invented the flat white. It's all about the execution, it's all about who MAKETH the best coffee See the video on LinkedIn.